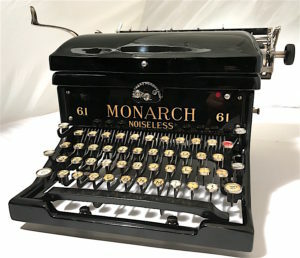 “Monarch Noiseless 61” is an uncommon name variant of the Remington Noiseless 6, which was likely marketed by the American Writing Machine Company, an organization that sold a variety of Remington products under the Monarch label in the 1930s. 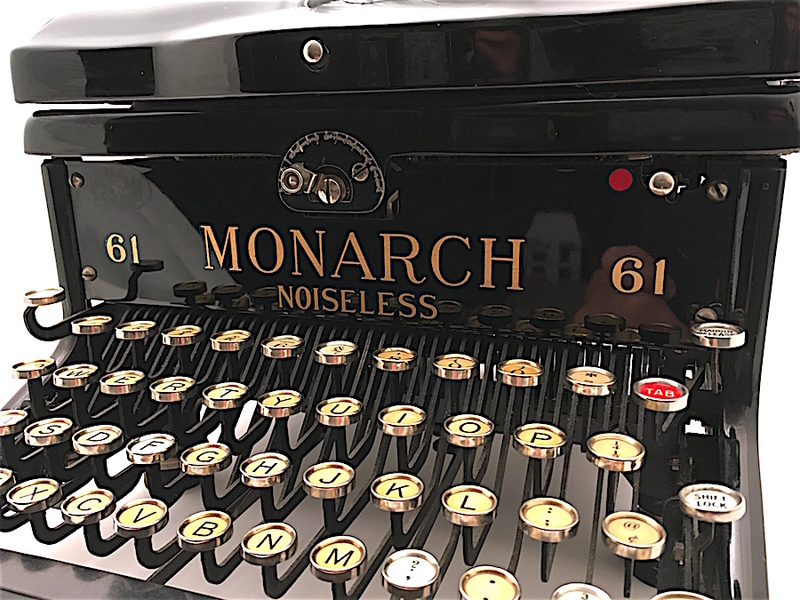 Apart from the machine featured in this post, only scant evidence for the Monarch Noiseless 61 exists. 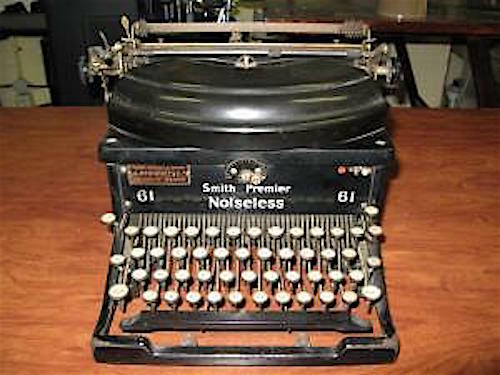 In foreign markets, Remington sold the Noiseless 6 as the Smith Premier Noiseless 61, with both German (QWERTZ) and French (AZERTY) keyboards. Why Remington chose “61” instead of “6” is a mystery, but “61” appears on all extant variants of the Noiseless 6. 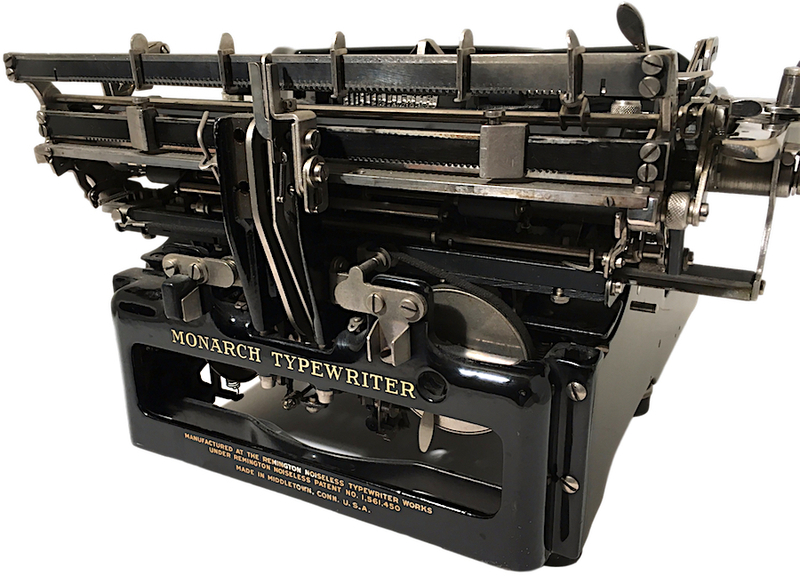 Both “Monarch” and “American Writing Machine” are recycled names from past enterprises. 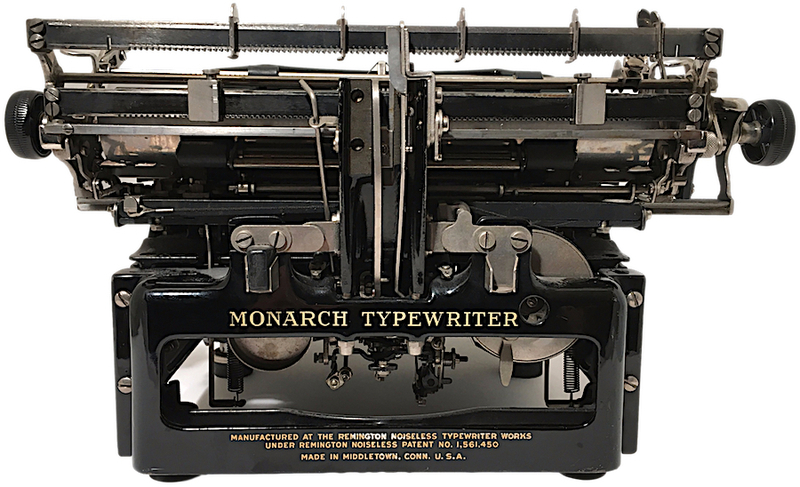 Monarch was originally a satellite of the Union Typewriter Company (UTC), a trust established in the late 1800s, consolidating large parts of the typewriter industry. Executives at Remington generally controlled UTC. 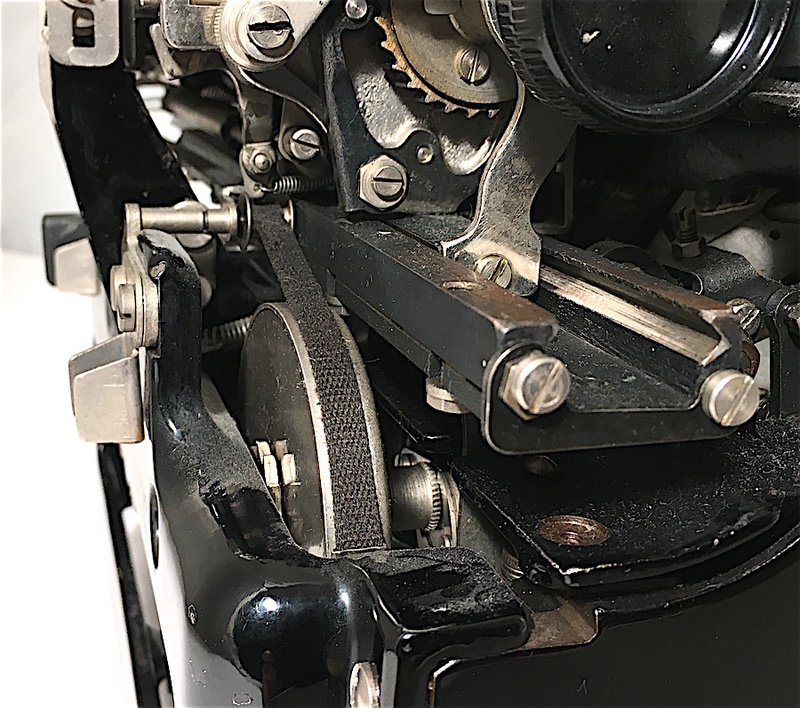 The American Writing Machine Company was an independent company that manufactured the Caligraph. In 1893, it was one of several companies that formed the UTC, but, over time, Remington subsumed all of the trust’s assets and marks. 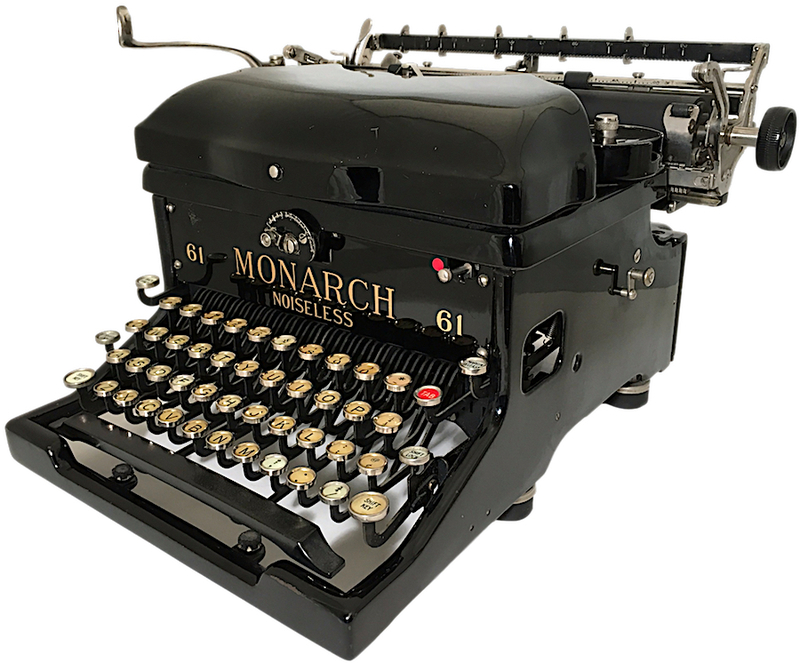 As near as I can tell, little has been written about the revitalized Monarch label or the reconstituted American Writing Machine Company, which continued as dealerships throughout the nation. How independently these stores functioned is uncertain: they appear to have sold principally Remington products or former trust brands. 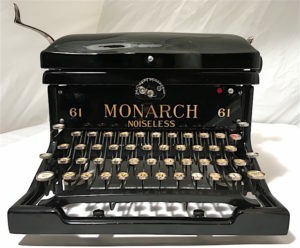 Both Monarch and the American Writing Machine Company played important roles in Remington’s marketing efforts, especially during the Great Depression. 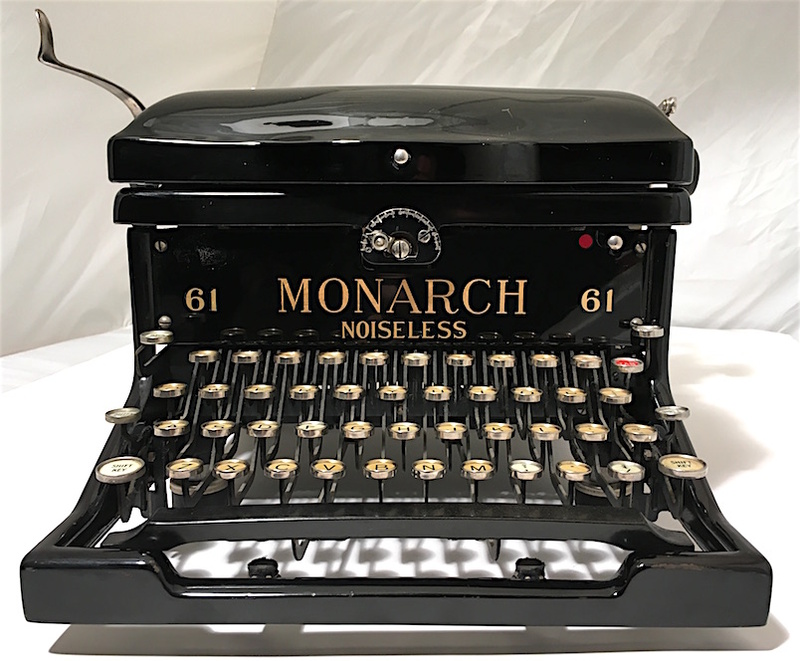 Only with difficulty was I able to locate possible mentions of the Monarch Noiseless 61 in advertisements for the American Writing Machine Company, adverts that reference both standard and portable typewriters, though only portable machines are depicted. The serial number on my Noiseless 61 is X207186, following the convention for the Noiseless 6 and dating it to 1931. 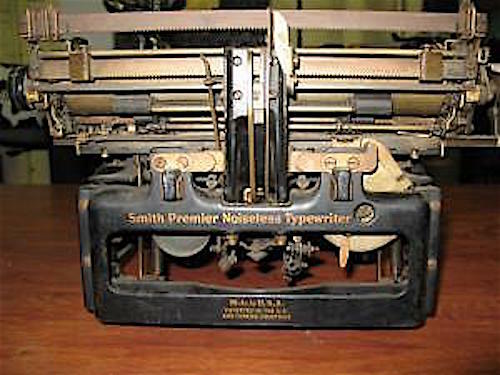 Unlike the Smith Premier models, the Noiseless 61 displays a QWERTY keyboard. It was sold, most likely, in the United States exclusively, as Remington generally held Smith Premier for foreign markets. 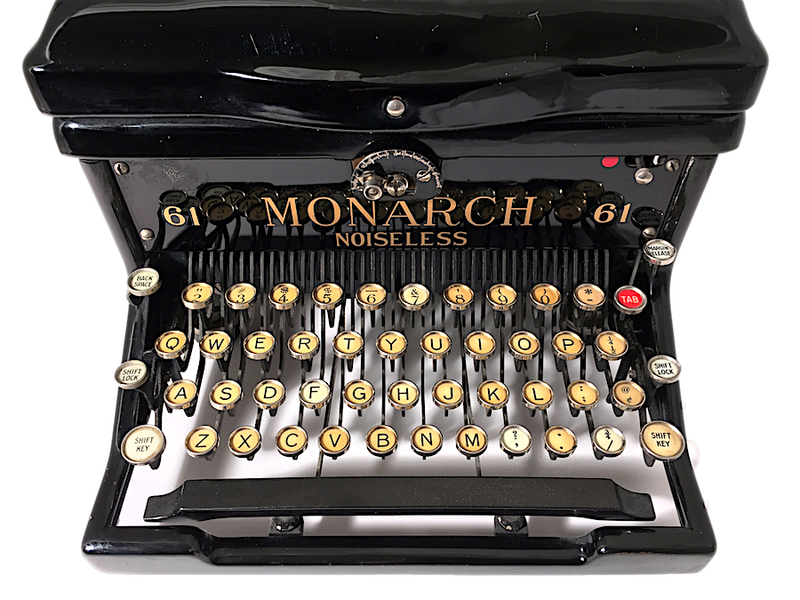 While collectors may be unaware of standard Monarch noiseless typewriters, the U.S. government was not. 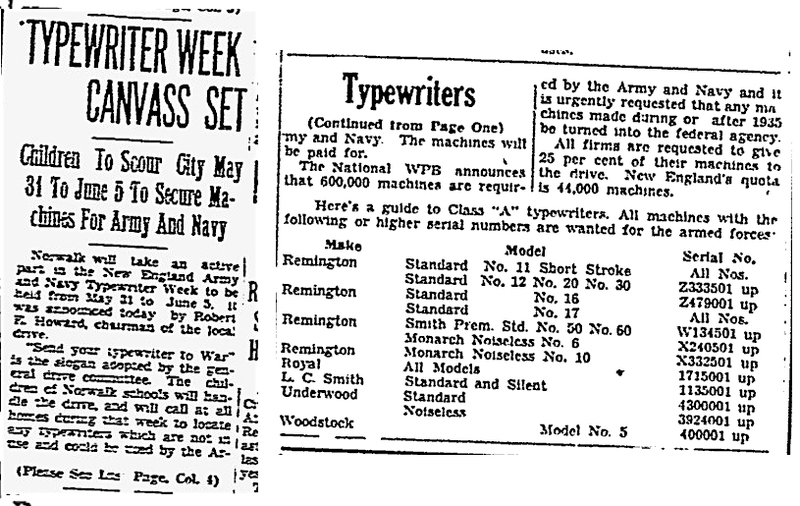 During World War II, the army and navy sought donations of typewriters, specifying acceptable models — all standard machines, not portables. Included were the Monarch Noiseless No. 6 (the 61?) and the Monarch Noiseless No. 10. 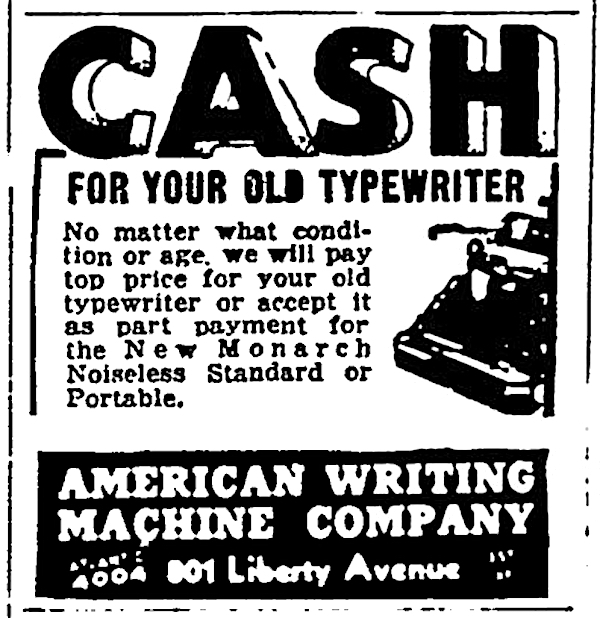 “Send your typewriter to war.” From the Norwalk Hour, May 26, 1943, front page and continuation on back page. I was struck by the Noiseless 61’s extraordinary beauty when I noticed it on ShopGoodwill.com some weeks ago. It’s absolutely gorgeous! But, hold your breath, it’s miserable to type on. Not that the Noiseless 61 is defective in any way… well, actually, it is… it doesn’t make any damn noise! Were I to attempt to write on this machine, I’d probably wreck it, pounding hard on its keys. 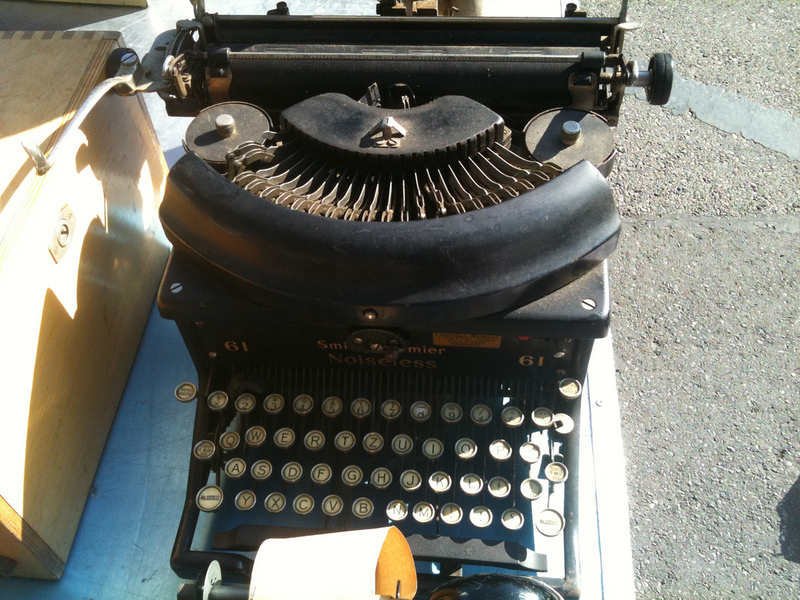 I need the clickety-clack of a traditional typewriter! There’s something mysterious about writing on a machine that doesn’t do the usual roaring and rattling and shaking about. 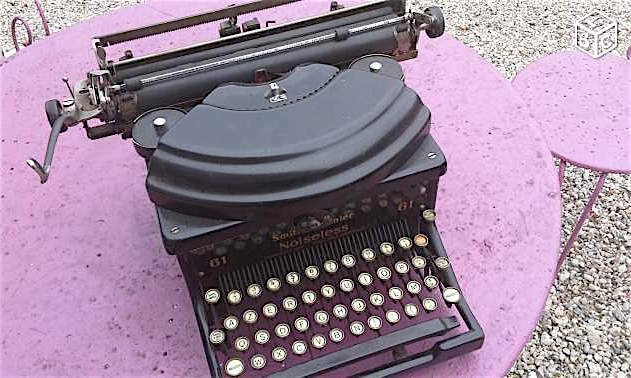 Our old Underwood, in the sacred confines of our palatial office, gives a very good performance of a Chevrolet, starting on a cold morning to climb the Derry street hill, but this Remington Noiseless 6! 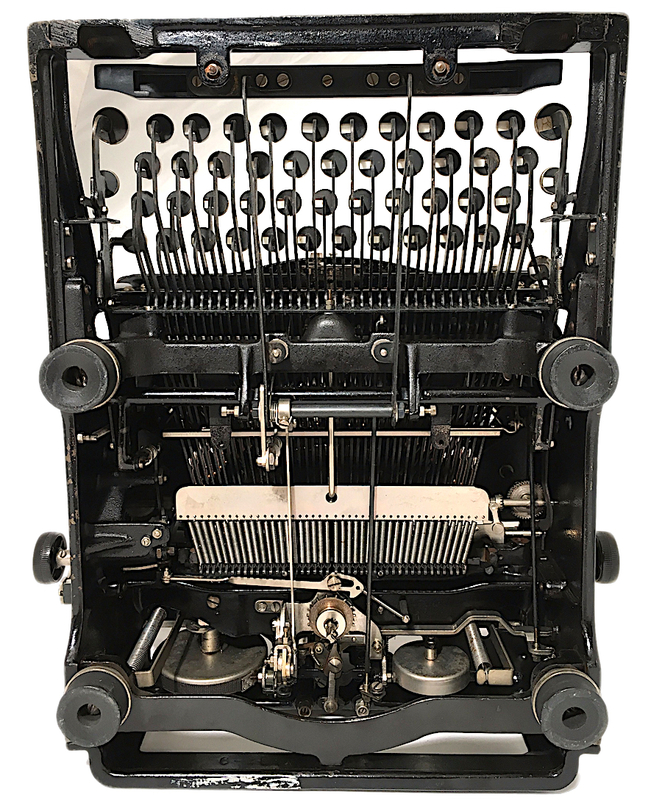 We can’t get used to it; here we sit, banging away with a vigorous two digits in the hit and run system of typing we have always favored, and no sound other than a subdued click comes out of the machine. It’s not quite right; it smacks of something unholy, of something sinister. It’s like drinking your coffee out of the saucer without making a sound. 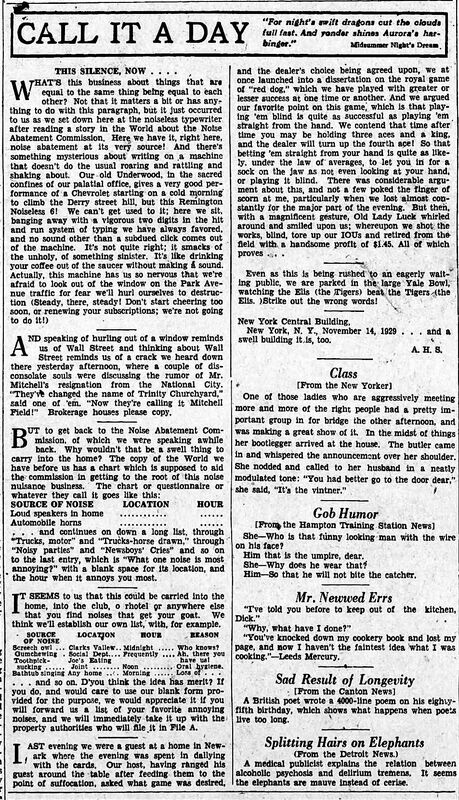 From the Harrisburg Telegraph, Harrisburg, Pennsylvania, Nov. 16, 1929. 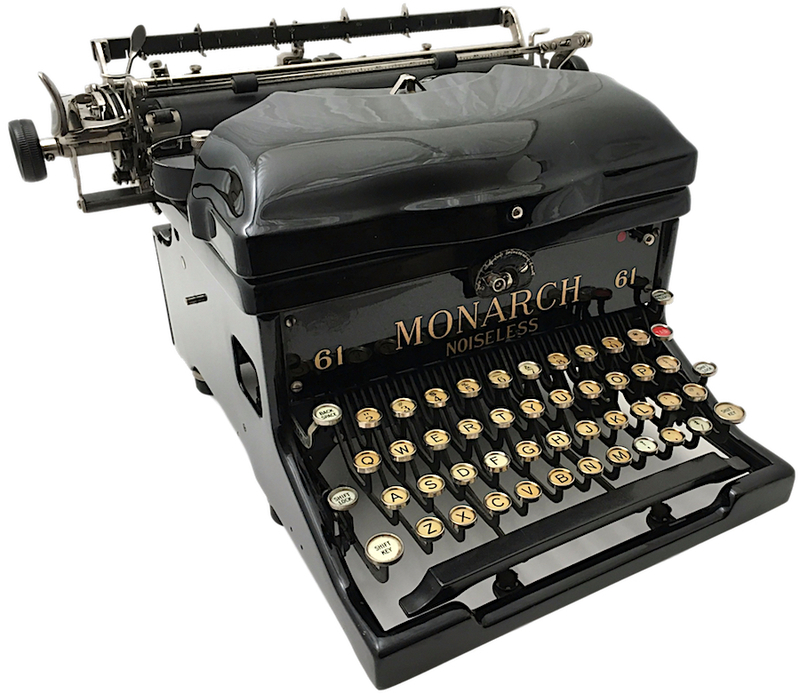 For those of you who are wondering, though I won’t type on it, I have set it on display with my collection of Monarch visible typewriters. My 61 might not make a sound, but it will be seen. Closeup of label on rear of machine. The white lettering is not an effect of lighting, but a slight discoloration of the lettering. Closeup of the front face and some control element. 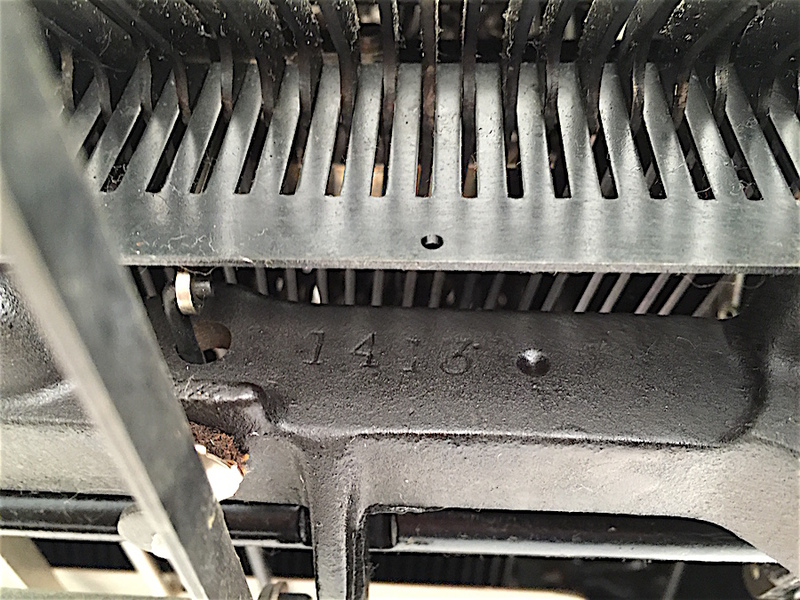 This number is stamped into the underside of the frame (mold number?). A “2” (not pictured) is also stamped on the same piece. The mainspring and draw band. See the Noiseless 6 in action here. 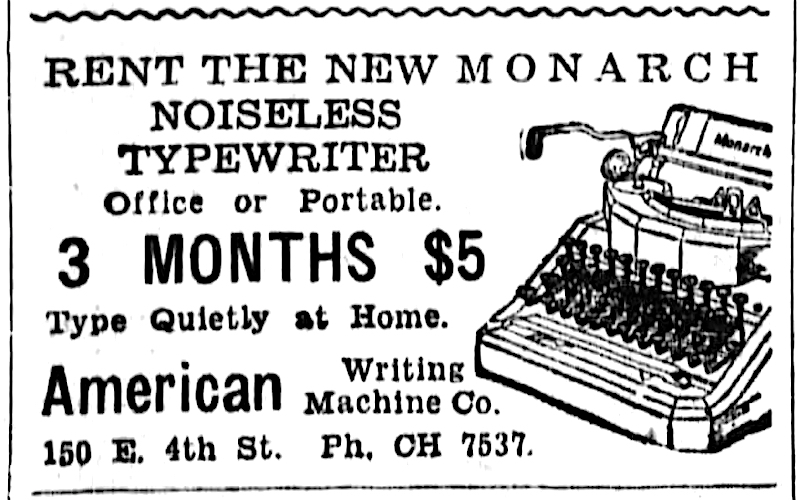 This advertisement references office and portable noiseless Monarchs. From the Cincinnati Enquirer, Sept. 8, 1935. 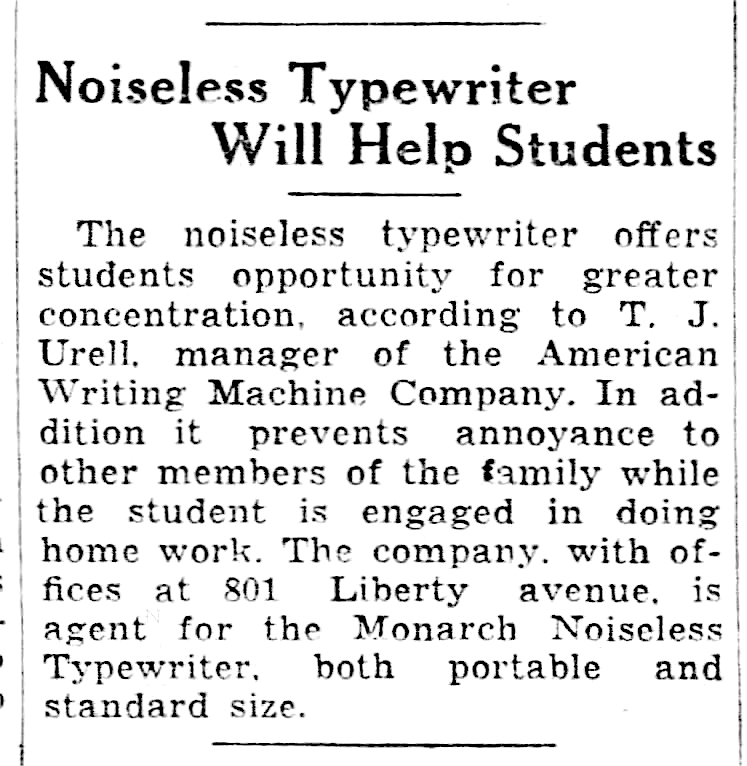 This advertisement references standard and portable noiseless Monarchs. From the The Pittsburgh Press Nov. 15, 1935. 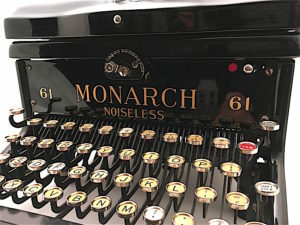 This “boilerplate” — advertising disguised as a news story — mentions both portable and standard Monarch noiseless typewriters. From the Pittsburgh Post-Gazette, Jan. 17, 1938. A Smith Premier Noiseless 61 with QWERTZ keyboard, as seen at Retro Tech Geneva. Another Smith Premier Noiseless 61, which was offered some time ago on the now-defunct auction site Loquo. Unknown keyboard arrangement. Backside of the same machine above. 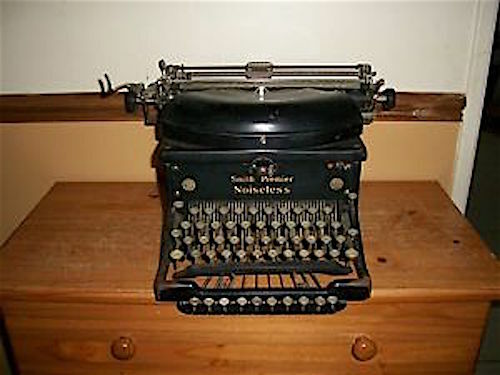 A Smith Premier Noiseless 61 with AZERTY (French) keyboard. Another with extra keys, but not labeled 61, unless those globs of color on either side of the faceplate contain the model designation. Stunning! It looks nearly new. Problematically, I don’t know for certain that “Monarch,” in this instance is a brand. 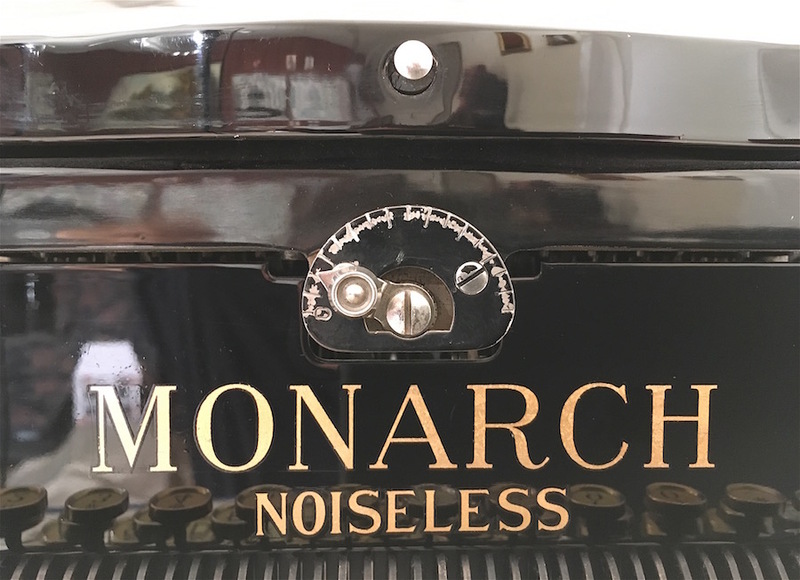 The model could simply be “Monarch Noiseless 61”. 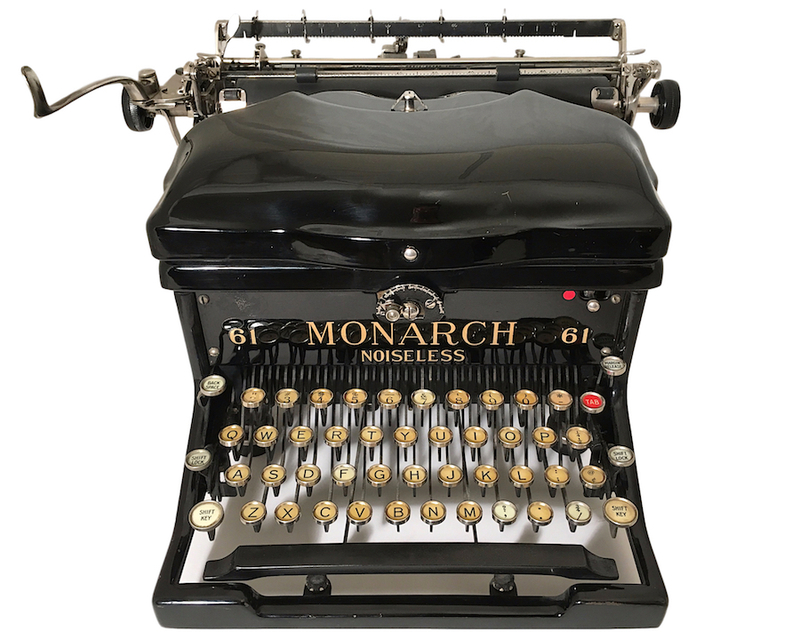 Further complicating matters, though, your Monarch could have been the brand of the American Writing Machine Co. or the Monarch Typewriter Co. The former was a chain of dealerships, the latter, perhaps a marketing arm of Remington (not even an actual company, possibly). And then, finally, these Monarchs were sometimes advertised as a “Remington – Monarch,” as if having two product designations! All that said, the key data points remain: manufacturer, manufacturer model, brand, and brand model. Nice post & photos, thank you! My standard machine is surprisingly quiet. One thing to consider is the hardness of the platen. On aged machines, the platens are sometimes very hard, creating a very different sound than when the machine was new.